telescopic antenna for portable use or inverted V dipole antenna. To establish communications under conditions, where VHF frequencies as used for military communications are not suitable (too long distances, no direct sight distance), the Swiss Army does still rely on shortwave communications for ionospheric long distance connections: The Racal Syncal with the Swiss designation SE-226 has been acquired in the early eighties. The transceiver can be used as portable backpack set powered from internal accumulators and a telescopid antenna, or it can be used as a vehicle based mobile transceiver or feed an inverted V dipole antenna for longer distances. There is the possibility to control the SE-226 from the remote control set Fernbetriebsgerät FBA-227/412. Attach a charged NiCd accumulator to the bottom face of the set; the accumulator charger can be fed from 12 or 24 Volts DC from a car battery or from 220 V mains. 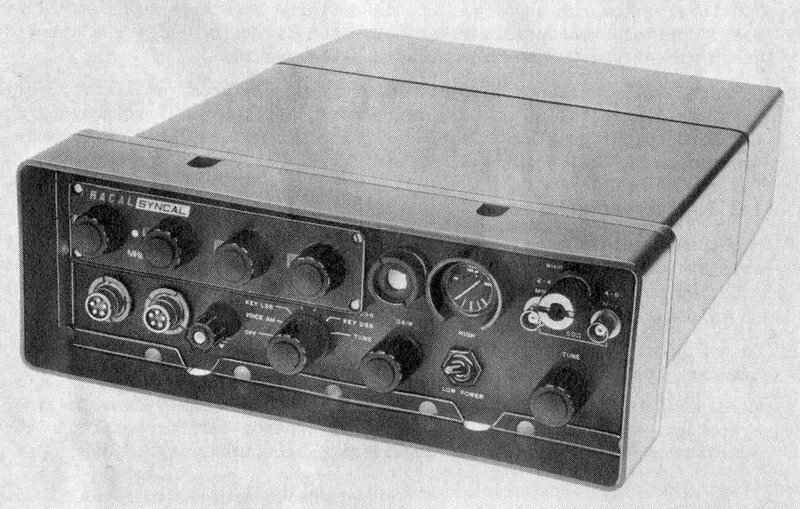 The "Mikrotel", the telephone - like handset wit ha speaker and a microphone and the push-to-talk button is plugged in at the left side of the set, the whip or the dipole antenna connected to the corresponding sockets. Use the modes switch to select AM VOICE for AM mode, or VOICE LSB or VOICE USB for single sideband or telegraphy operation, the same switch acts as main switch. Use the four decadic knobs to select the operation frequency.